Jackals are members of the same family as dogs. They are a type of wolf and their hair is usually brown and coarse. jackals have long legs. Jackals have blunt feet and fused leg bones. Their canine teeth are curved to make it easier in hunting smaller animals. They are found in Africa, Asia and Southeast Europe. They eat small mammals, birds, reptiles, smaller gazelles, sheep, insects, fruit, berries and sometimes even grass. Jackals are omnivorous animals. Jackals live in pairs in territories that they claim for themselves. Sometimes some of their adult children live with them. Jackals are nocturnal. That means they like to be awake at night and sleep during the day. Jackals vary in size depending on the species. On average, jackal can reach 15 to 35 pounds in weight and 15 to 20 inches in height at the shoulder. Jackals respond only to the sounds produced by the members of their family. They ignore all other calls. Jackals can run an average of sixteen miles a minute. 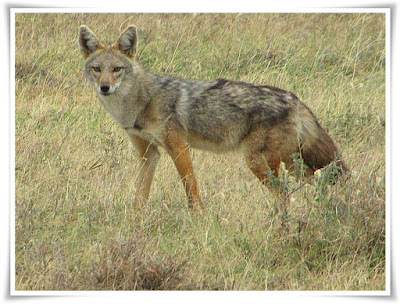 Jackals sometimes eat remains of dead animals that were killed by large predators. Main predators of jackals are leopards, hyenas and eagles. Young animals are especially easy target of eagles.